Lt. Avrie Schott and Sgt. Kirk Flatten empty the drug drop box. 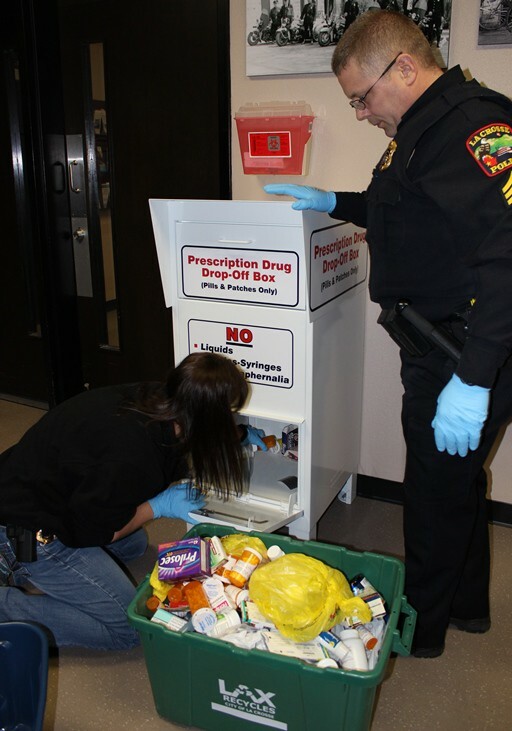 It has been one year since the La Crosse Police Department installed a permanent Prescription Drug Drop-Off Box as part of a county-wide initiative to provide a safe and convenient way to dispose of household medications. Over the past year, we have had great success collecting and disposing of 800 POUNDS of unwanted and/or unused prescription drugs! The Prescription Drug Drop-Off Box has ensured that these medications do not end up in the garbage or used by unintended parties. Prescription medication abuse has been a significant problem in La Crosse County, as well as across the country, for many years. These drop boxes are intended to help prevent drug abuse and addiction by reducing the amount of excess medication in the community. The La Crosse Police Department Prescription Drug Drop-Off Box is available in the main police lobby area from the hours of 8:30AM – 5:00PM, Monday through Friday. We accept all prescription medications in pill and patch form – please do not bring liquids or drug paraphernalia. There is a “sharps” container available for needles and syringes. You can leave the medication in the original container, but if you so wish, we prefer pills to be removed from the original packaging and placed together in one package (zip loc bag, box, plastic container, etc.) All items can be placed in the box anonymously. If you have questions, please contact (608) 789-7238. You can remove pills from all packaging and deposit them together in a container.